Broadcasting regulator Ofcom has found Fox News in breach of the broadcasting code after one of its contributors called Birmingham a "no-go zone" for non-Muslims. 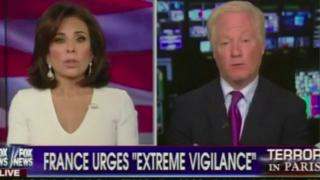 The comment was made during an episode of Justice with Judge Jeanine by guest Steve Emerson in January. An Ofcom spokesperson said it was a "serious breach for a current affairs programme". Fox said it regretted the comments and apologised to the people of Birmingham. In an interview on 11 January, American terrorism commentator Mr Emerson said: "There are actually cities like Birmingham that are totally Muslim, where non Muslims just simply don't go in." The programme was reflecting on the Paris terrorist attacks in January, in which 17 people were killed. Fox News is an American channel but is licensed by Ofcom for broadcast in the UK. In its Broadcast Bulletin, Ofcom said: "The programme, in stating that Paris contained "no-go zones" and that the entirety of Birmingham was "totally Muslim" and a city "where non Muslims simply don't go in" presented the audience with materially misleading facts." The programme was found to be in breach of rule 2.2 of the code, which states: "Factual programmes or items or portrayals of factual matters must not materially mislead the audience." Presenter Jeanine Pirro issued an apology on 17 January and said: "We deeply regret these errors and apologise to the people of Birmingham, our viewers and all who have been offended." Mr Emerson later apologised for his "terrible error". How will Fox News comments hit tourism in Birmingham?